N. N. Vohra, Governor Jammu and Kashmir, today appealed to all segments of society and the leaders of all political, social and religious organisations, in all the regions of the State, to shed all doubts and differences and work closely together for the advancement of Jammu and Kashmir and its people, settling all outstanding issues through dialogue and discussion. For securing an environment of peace and normalcy, which is imperative for speedy socio-economic development, the Governor stressed that the State Government would need to deal effectively with all factors and forces which encourage confrontation, regionalism, communalism and any kind of divisiveness. Greeting the people on the eve of 69th Independence Day, the Governor, in a message, said “On this auspicious day, when India gained Independence, I greet the people of Jammu and Kashmir and wish them a peaceful, happy and prosperous future.” He paid homage to the great leaders who made enormous sacrifices and carried out a prolonged struggle to liberate India from the colonial yoke and secured freedom for the country. The Governor observed that in the past nearly seven decades, since we gained Independence, the country has achieved notable all round development. “We can be rightly proud of the commendable progress gained in various spheres, which has enabled India to emerge as the fastest growing economy in the world”, he said. Referring to the people who are still denied the fruits of progress, he said that it is unfortunate that a significant percentage of our population still continues to subsist below the poverty line. To ensure that all our people are enabled to lead satisfied and productive lives, free of worry and neglect, it is necessary to ensure that future growth and development is effectively inclusive and particularly encompasses those segments of our population which have continued to remain socially and economically neglected. The Governor said that Pakistan has still to respond to India’s repeated initiatives to engender an environment in which the two countries can enjoy friendly, peaceful and prosperous relations. It is unfortunate that continuing support to subversive and terrorist activities from across the borders has, over the years, resulted in thousands of innocent lives being lost and a large number of Police, Central Armed Police and Army personnel laying down their lives to safeguard the security of the State. “I take this opportunity of paying tribute to all the officers and men of our Security Forces who made the supreme sacrifice to preserve the territorial integrity of our country. I also pay homage to the people of our State who have continued to boldly encounter varied subversive forces and remaining deeply committed to preserving the democratic framework”, he said. 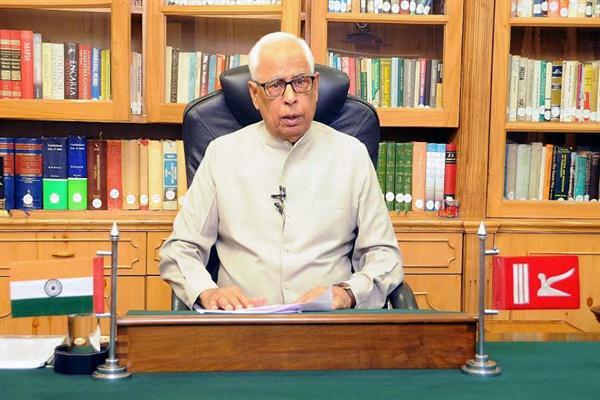 Referring to the 2014 floods, the Governor said that the growth trajectory of Jammu and Kashmir was most severely disrupted by the devastating floods of September 2014 which caused untold damage in the State. “Efforts are still under way to repair and reconstruct the enormous destruction caused by these floods to public infrastructure and private properties”, he said. The Governor observed that the six yearly elections to the State Legislature, held last winter, led to the establishment of the PDP-BJP Coalition Government earlier this year. Consequent to the serious disruption of the economy, caused by the 2014 floods, the State Government faces the formidable challenge of creating an investment environment and generating resources and job opportunities. The Government also faces the challenge of providing good governance which would bring about visible improvement in the lives of the common people. He stressed “For such vital objectives to be achieved, the entire administrative machinery shall need to function with speed, efficiency and total accountability, altogether free from corruption or any kind of interference”. Among other steps, the Governor stressed the advancement of urban and rural self-governing bodies which would go a long way in involving people at the grass-roots in the tasks of governance. He observed that carrying through the long pending elections to the urban local bodies, implementing the required reforms in the urban governance systems and taking the next steps towards establishing Panchayati Raj would need to receive very early attention. Likewise, the prompt reconstitution of important public institutions, particularly those whose functioning impacts accountability and governance, would also go a long way in ameliorating the woes of the common man, he said.